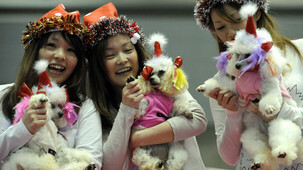 There are now more than twice as many pets as children in Japan, with a majority of those pets being dogs. Hmmmmm, that means they could probably use more dog beds. This entry was posted on Monday, June 11th, 2012 at 3:27 PM. It is filed under Blog. You can follow any responses to this entry through the RSS 2.0 feed. All content © MindsInSync Inc.